How the cards are shuffled (called a Quadration), exposing the dynamic nature of our lives. The quadration essentially represents our separation from the perfect state. Since the theoretical basis for both the natural order and the quadration has already been presented by Richmond, we will not discuss it further (see 'History'). Instead, we will use this information and focus on developing techniques to interpret the nature of these cards in both their static (natural order) and dynamic states. When the cards are ordered from ace to king, for all suits in the order of hearts, clubs, diamonds and spades, the cards are in their natural order. Along with the ordering of the cards, there is another aspect of the natural order that has to do with card placement within a framework. 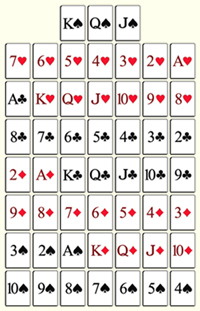 The cards are dealt out from right-to-left, and top-down in a matrix of 7 rows and 7 columns, with the 3 remaining cards placed atop the matrix (see 'The Solar Book'). The quadration represents a disruption to the perfection of the natural order, essentially the separation from our perfect nature. Using a simple mathematical formula, the cards are shuffled and then placed again in the framework using the natural order sequence. But now most all of the cards have moved from their original positions. As Richmond says the symbols have been 'thrown to the wind'. However, the mathematics that defines the quadration is not arbitrary. Rather, it is a well-crafted formula that repeats itself after 90 durations. In other words, the cards 'appear' to show up randomly over time, but instead are following a predefined path through the positions in the framework. After 90 quadrations the cards are again in the perfect order! Our life is comprised of a series of moments that map out linearly through time. The ability (and requirement) to move through time is due to the quadration. Thus, the quadration is a time-keeper, and ultimately a calendar. In the backdrop of our life as we move through time is the perfect state. This perfection is always present, though we are often unaware of it's presence, and our place within it. Contemplating the interaction between the natural order and the dynamics of the quadration will eventually unveil this perfection, which is a prime goal of this work. In fact, I suggest here that it is these 2 fundamental principals that define the essential mathematics for this card science. Accompanying the mathematics, we have the framework within which these cards reside. The framework provides an arena for the unfoldment of life in our dimension. Each house in the framework is affected by the forces governing the rows and columns, providing a unique environment for the card to fulfill a particular destiny. There are many layers of information that can be combined in order to attain a deep understanding of the workings of life within the framework, while at the same time a simplified approach can be taken to where only a few factors are taken into account in order to address a particular struggle that predominates. The mundane and sublime are but endpoints of a bridge that we build as we transform our lives through the use of this science. It is the study of the movement of these cards through the quadrations, taking into account the dynamics of the framework, that provides the basis for the interpretation of the individual symbols. Knowing that the quadration is not arbitrary is of great importance, as it proves that our departure from perfection was not meant to be a disruption, or a punishment. Instead, it is a prime factor in our evolving awakening. In other words, our apparent departure from perfection was designed to lead us back to what we have had since the beginning. Our path through these quadrations reveals the experience that we offer to Creator, essentially proving the value of our very existence. Creator sends us out into this matrix with the intent of being able to experience himself, something that could not happen if we were to remain with him in the perfect state. We chose to offer this experience to Creator, with the goal of uniting again when the life is finished. But the ultimate prize is to unite with Creator before the life is ended, and to that purpose I devote this work.